Need an affordable storage container rental in Phoenix, and fast? Haulaway Storage Containers is here to help. We are Arizona’s temporary storage solution experts. We offer durable and versatile exterior storage containers to our valued clients throughout the Western United States. Haulaway knows that you are busy, which is why we strive to have the best customer service around. We make it easy for you with convenient online account service options, as well as a helpful voice picking up the phone. We offer onsite delivery and placement, as well as prompt removal to get your job site cleaned up fast. When it is time to rent a storage container, Haulaway has you covered. Just give us a call or browse our convenient website to see our selection and service options. We also offer quick online quotes – get started on your project anytime day or night. 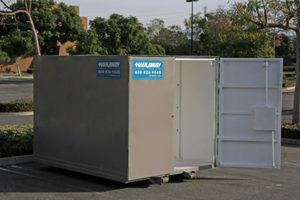 See the affordable rental storage container selection we have for delivery in Phoenix and beyond. Haulaway services our valued clients with affordable storage container rentals at our Phoenix location. We are centrally located at 3515 East Illini Street in Phoenix, Arizona, allowing us to quickly send out and pick up dozens of best storage containers daily. Whether your job is big or small, we strive to have the containers you need in stock, when you need them. We also have an additional (and nearby) Arizona location in Yuma. Having multiple locations allows us to keep a wide variety of rental container sizes on hand, so we can fill orders on a moment’s notice. If you need to rent a storage container and have it delivered to you, and fast, one call to Haulaway does it all.